This petition has been created by CCFD, Ethique sur l'étiquette, Peuples Solidaires, Sherpa, Amis de la Terre, CGT, Terre des H. and may not represent the views of the Avaaz community. “I am the President of the Town Council (Panchayat) of Thervoy, a village of Dalits (Untouchables), located in Tamil Nadu, in the South of India. 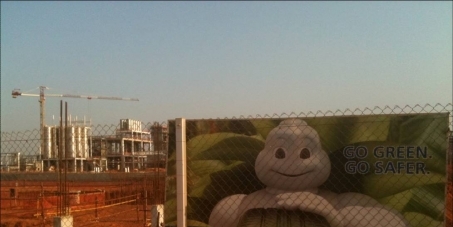 For several years, the inhabitants of my village have been trying to struggle for their rights against the negative impacts generated by an industrial park developed by the Tamil Nadu State, and in which the Michelin French Group is the first company to set up. If the Tamil Nadu State has turned a deaf ear to our claims, we hope that Michelin, a company concerned about its reputation, will respect its ethical commitments and will listen to us. A strong mobilisation in France and in the rest of the world could turn out to be decisive in pushing the company’s CEO into respecting the ethical commitments the company speaks in its communication. Indeed, this is a serious matter. The obligation to inform and consult the communities has been respected neither by the Tamil Nadu State nor by Michelin. By destroying the collective forest which has been providing us with food, shelter and health care for many generations, the industrial park deprives us of our livelihood. When the industrial park will be entirely developed, we shall be forced to leave our land, without any compensation worthy of its name. Today, 10 other villages have become aware of the irreversible impacts of this project on our lives. Together, we have just adopted a joint resolution in opposition to the park. As a result of the legal actions which we have started against the Tamil Nadu Government, we are victims of severe repression from the authorities. Michelin has chosen to ignore this situation. The company is actually about to start producing its first tyre in its factory in spite of the controversies that it has caused. The CEO of Michelin has the future of our communities in his hands. In order to develop its activities in the respect of our fundamental rights, Michelin must immediately suspend all activity on the park and carry out an independent Human Rights Impacts Assessment of its project, in close collaboration with our communities. Help us to make our voice heard: ask Michelin not to be a party to human rights abuses and to suspend the project. Thank you for signing and sharing this urgent call! Action supported by: CCFD-Terre Solidaire, CGT, SHERPA, Tamil Nadu Land Rights Federation and Thervoy Sangam.